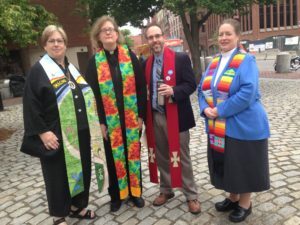 Faith leaders from the Maine Council of Churches who attended Friday’s press conference outside Senator Susan Collins’ office included (L to R): UCC Maine Conference Minister Rev. Deborah Blood, MCC Board member and UCC representative Rev. Alyssa Lodewick, MCC Vice-President Rev. Allen Ewing-Merrill, and MCC Executive Director Rev. Jane Field.